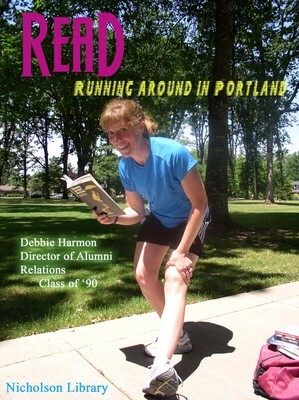 Debbie Harmon, Director of Alumni Relations, class of 1990, reading Running Around Portland: A Guide to the Best Running in the Portland, Vancouver Area, by John Perry and Buzz Willits. Terry, Paula and Nicholson Library Staff, "Debbie Harmon READ Poster" (2008). READ Poster Gallery. Image. Submission 22.